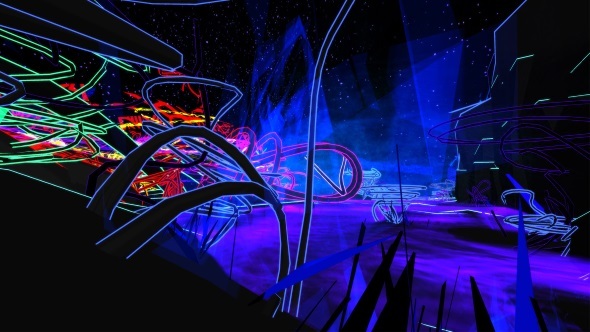 Games can do things that are impossible in other media, including… whatever is happening in 0°N 0°W, an indie adventure about sensory overload and exploration that launched March 1. Check out our most recent round of #ScreenshotSaturday indie games in development. Dominic covered 0°N 0°W (pronounced Zero North Zero West) earlier this year, noting its randomly-generated, open-ended world that you can travel through however you see fit, as dazzling colors and impossible geometry swirl by. You can watch the new launch trailer above. Developer Colorfiction say the odd name is in reference to the fictional Null Island, a 100-square meter landmass supposedly set in the Gulf of Guinea, at the coordinate point where the equator intersects with the prime meridian – zero degrees north by zero degrees west. It’s unclear how Null Island plays into 0°N 0°W, which begins with a rest stop in the middle of the American southwest. But the game is so strangely alluring that it might be worth investigating. 0°N 0°W is available on Steam, and is 10% off through March 8.